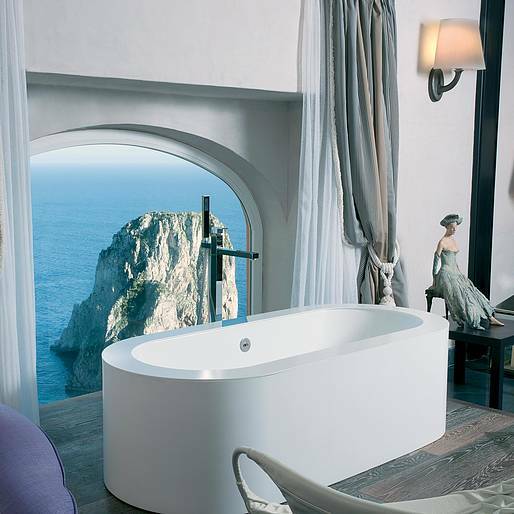 One of the most luxurious open space suites on Capri island, the Master Suite at Caesar Augustus is beautiful both inside and out. 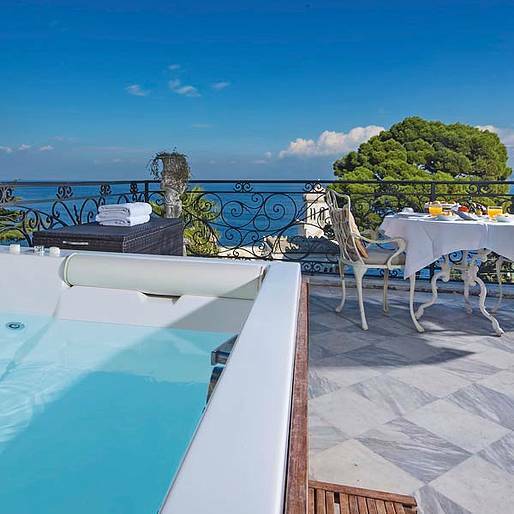 This 85 square meters suite has a private garden, a magnificent terrace and a luxe jacuzzi. 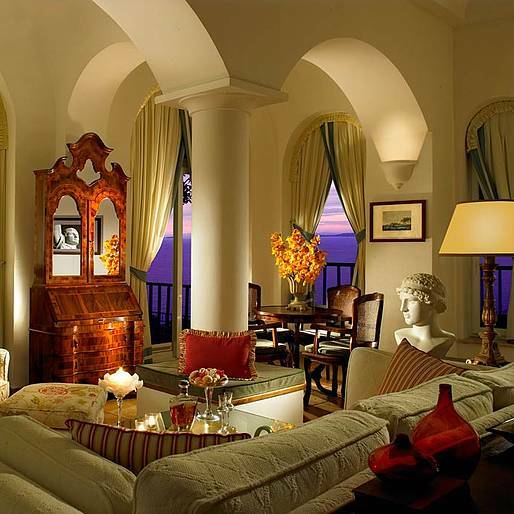 From the 180 degree view of the sea to the architectural style of Ancient Rome, here you'll feel like an emperor! Designed by the famous French architect Le Corbusier, Punta Tragara is pure luxury! Our favorite room is the Art Suite: here you can enjoy a fantastic view of the Faraglione from the tub, your bed and, of course, from your fabulous private terrace. 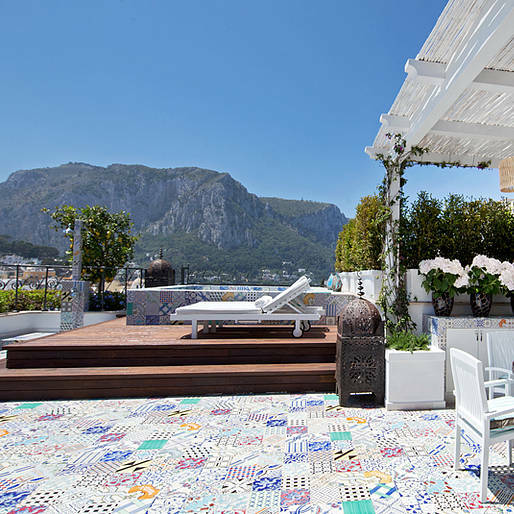 Quisisana is more than a hotel: it's a piece of Capri's history and boasts luxury accommodation for up to 300 guests. 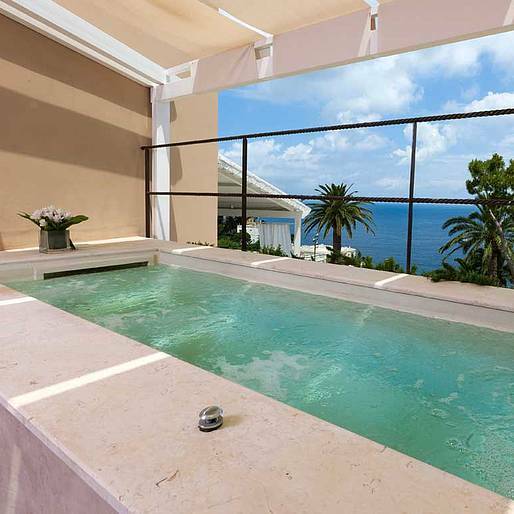 Of course, we suggest you choose one of the breathtaking sea view suites, perhaps one with two bathrooms with a jetted tub. Excelsior Parco is a charming boutique hotel with gorgeous rooms, impeccable service, and luxury amenities. The "Deluxe 1906" is the most breathtaking room, located on the top floor and boasting the most sweeping views. One of the best hotels in the world according to Condè Nast Traveler magazine, La Scalinatella is an intimate boutique hotel in Via Tragara. 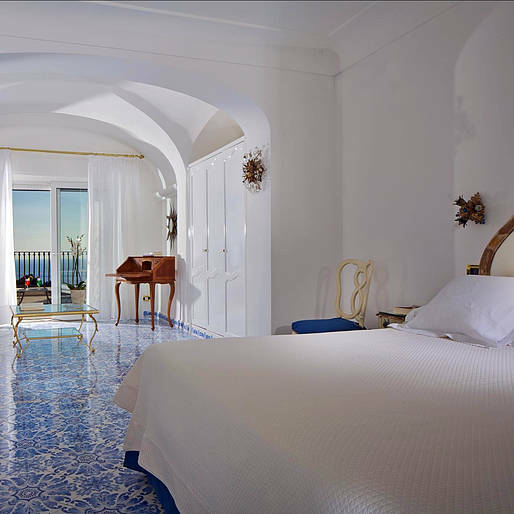 When you enter one of the 65 square meter luxury suites - with hand painted majolica floor tiles, vaulted ceilings, and a sweeping sea view terrace - you'll feel like you are in heaven. 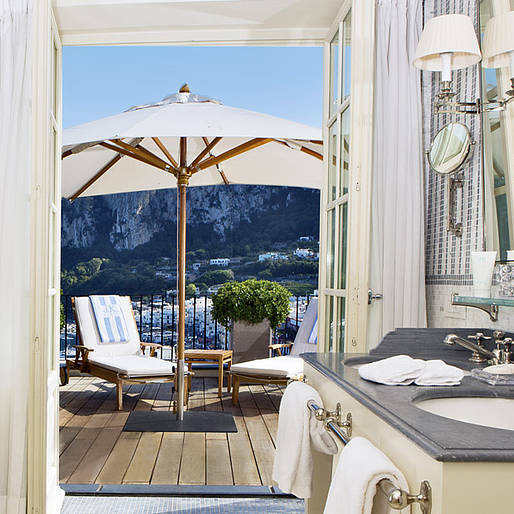 So Capri, so perfect. 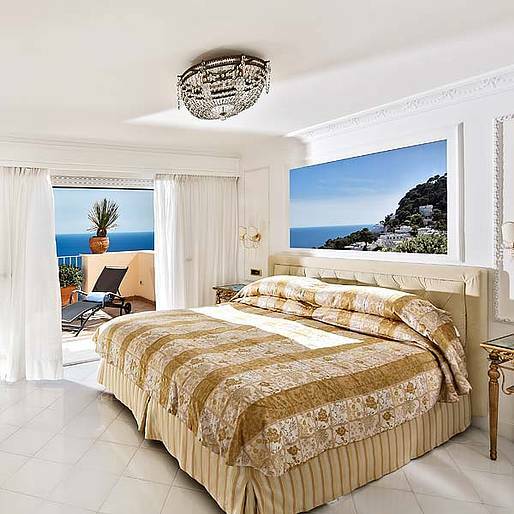 A superlative suite with a fitness area, outdoor dining and heated splash pool: if you want to feel like a Hollywood diva, Capri Tiberio Palace's Bellevue Suite is the place for you. The hotel was recently restored to perfection in a contemporary chic style. 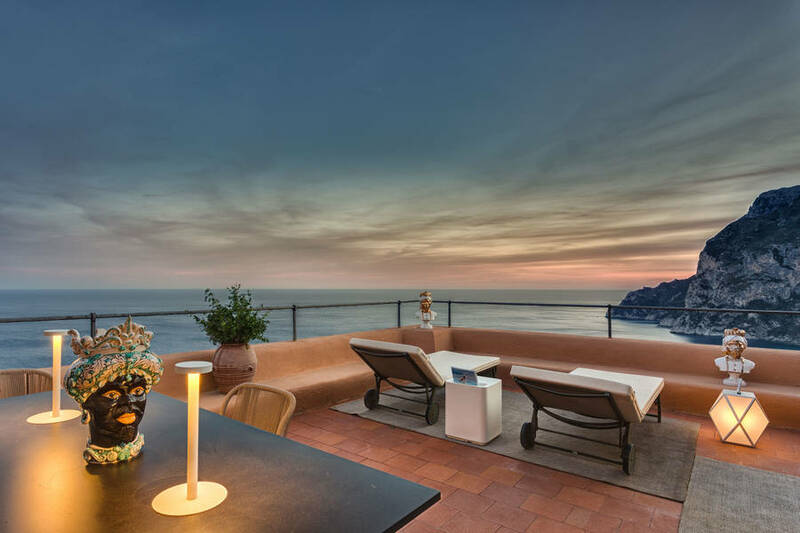 Double everything: in the JK Place Capri's Penthouse Suite you have two double rooms, two bathrooms and two large deck terraces. The perfect choice if you traveling with your family and need a lot of space: the luxury suite is 75 square meters and has a beautiful view overlooking the Gulf of Naples and the yachting marina.